People from Nordic countries have a reputation for being suicidal, but the data by WHO (World Health Organization) from 2012 show that this is more of an urban legend than an actual fact (although there is a little bit of truth in it in the case of Finland). 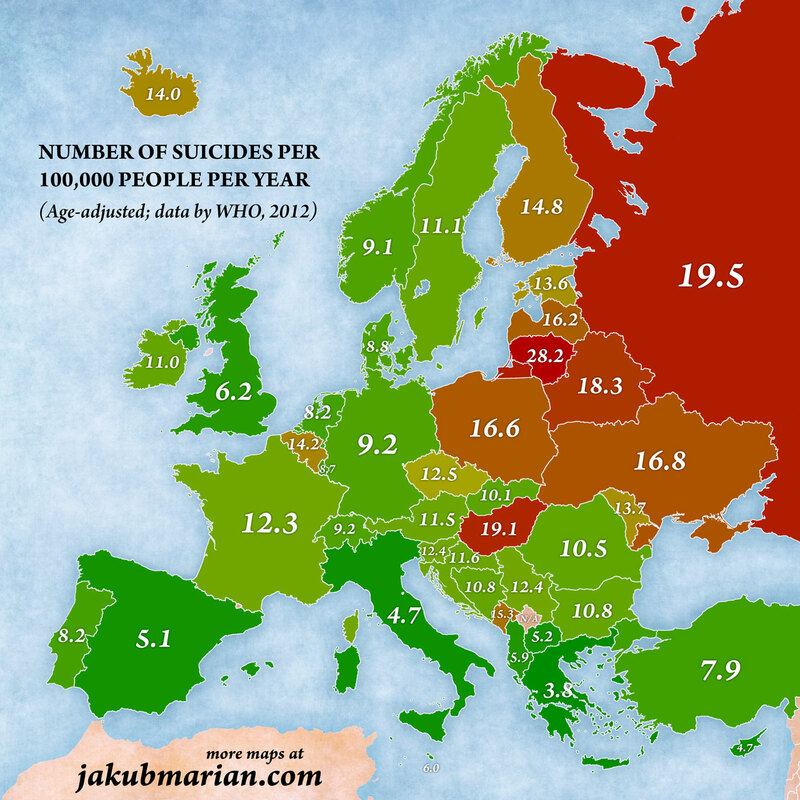 As the following map shows, if any part of Europe should have a reputation for being suicidal, it should be Eastern Europe. Note that the data by WHO are age-adjusted, which makes comparisons among countries more reliable. This means that the figures shown are not the real suicide rates but rather theoretical suicide rates if every country had the same age composition. The reason to do that is, roughly speaking, that the likelihood of committing suicide increases with age, so the crude suicide rate would be lower in countries with lower average life expectancy. But enough talking, here’s the map. For comparison, the rates for other major nations are: United States: 12.1, China: 7.8, India: 21.1, Brazil: 5.8, Japan: 18.5. Interestingly, men are much more likely to commit suicide than women in almost all countries in the world. The only countries in which women are more likely to commit suicide than men are Bangladesh, China, Indonesia, Iraq, and Pakistan. The following map shows the number of males who committed suicide per one female. 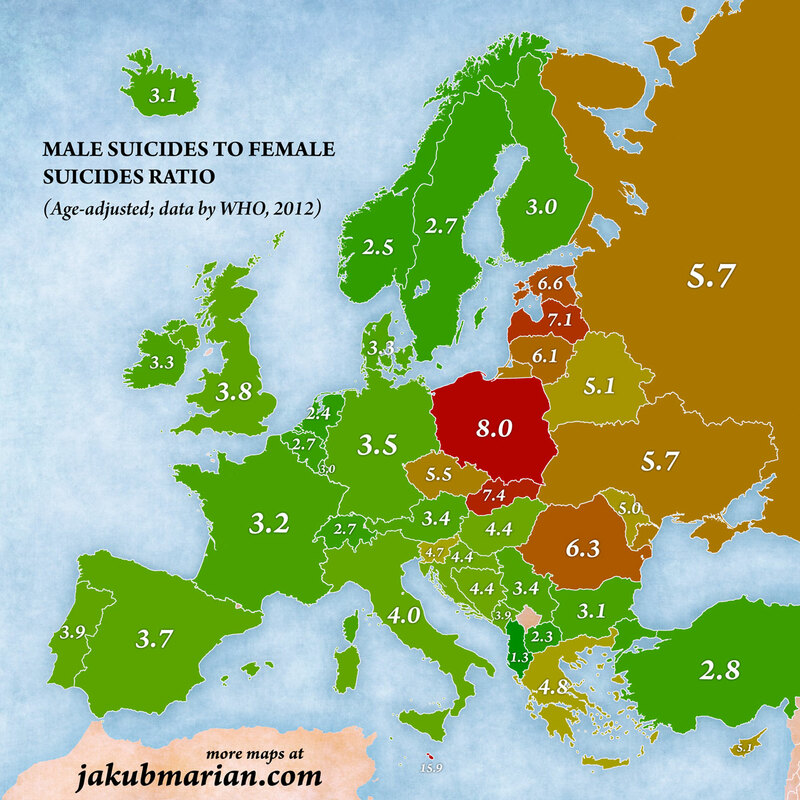 For example, the figure “8” for Poland indicates that 8 times more men in Poland commit suicide than women. Again, for comparison, the figures for other major nations are: United States: 3.7, China: 0.8, India: 1.6, Brazil: 3.8, Japan: 2.7. Please note that the largest figure, 15.9 for Malta, is not statistically significant because the population of Malta is too small (only two Maltese women committed suicide in 2012).